Horses are big animals and, as such, they eat a lot and drink a lot. Of course, this, in turn means that they also need a lot of exercise. A lack of exercise in horses can lead to all sorts of health problems and boredom. Exactly how much exercise they need depends on how much work they are going to be doing and on the horse itself. They need to achieve a level of fitness, much like humans, that is suitable for them as an individual. Horses can run. They can usually keep up a steady pace for a couple of miles – wonderful when you are riding them. But, if you try to make them do this when they are out of condition, they could become disabled or even be killed – much the same as if someone who had done no fitness training whatsoever and then attempted a marathon would make themselves very ill.If you are going to work your horse then you will need to build up its fitness. If it is out of condition to begin with, then you will need to start slowly and do a little more each time. 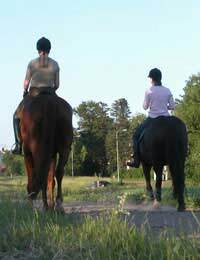 A soft horse – one that is out of condition or not trained daily – will get hurt if you just tear off on it – and this includes people who are just riding at weekends. A horse’s fitness should actually be visible. The horse should be hard to touch if he is in good shape. The ribs should be just visible as he moves and the backbone and hips should be well covered and rounded. He should not, however, be rounded all over, as fat brings on health problems, affecting the whole horse, even his fertility. A vet’s examination will be able to give you a good idea of how fit the horse is, and you should soon learn when your horse is over exerting himself. As mentioned above, you need to start gently when exercising the horse. Begin with light walking and then move on to trotting followed by running. If you do not follow this order and the horse is not warmed up, it is easy for him to pull muscles. Therefore stretching is important too. Ask an experienced rider to show you how to stretch the horse’s legs. It is important that you are shown how to do it correctly because if it is done wrong, the horse can get injured. You only have to pull his legs very gently in order to stretch them. The horse should enjoy his exercise time and should show you what he likes. You will start to learn about his needs and what he prefers to do. A horse which is kept in an open field will usually exercise himself to a large degree. And, if you cannot be there yourself, ask your yard to exercise the horse or use a horse walker – a machine which allows several horses to be walked at once. Obesity is a major concern for horses – so you should never let your horse get fat or unfit. It is not fair on the horse and could seriously hurt him. If you are not going to ride your horse daily then he must be exercised in some other way. Quite apart from the health risks for the horse if he is not exercised, both you and he will get far more enjoyment and satisfaction from riding if you are both fully fit.